What does $200 million in school reform buy you? Improved English scores and no big change in math achievement. That's the bottom line offered in a working paper issued by the National Bureau of Economic Research, which examined an education transformation project in Newark Public Schools undertaken by New Jersey Governor Chris Christie and then-Newark Mayor Cory Booker and underwritten by the fortune that Facebook made. The $100 million invested in the effort by Mark Zuckerberg and Priscilla Chan and matched by $100 million from foundations and other private donors made up about 4 percent of Newark's school budget over the five years of the grant. What the funding provided, according to the NBER researchers, was the flexibility needed by the city and district "to implement an ambitious slate of reforms." Changes included "within school" reform: a new teacher contract, new school leaders (including a new superintendent), a new curriculum aligned to the Common Core standards, and school turnaround efforts (known as "renew schools"); as well as "between school" reform: charter school expansion, school closure and a "universal choice" plan that allowed families to submit a single application to attend a more "effective" district or local charter school. The updated teacher contract accommodated a new teacher evaluation system (that combined classroom observations with student growth and other indicators such as teacher attendance); differentiated teacher compensation, including incentives for high performers to stay in low-performing schools; extended learning time; and greater school-based control, including the ability for teachers to vote to overturn parts of the collective bargaining agreement. 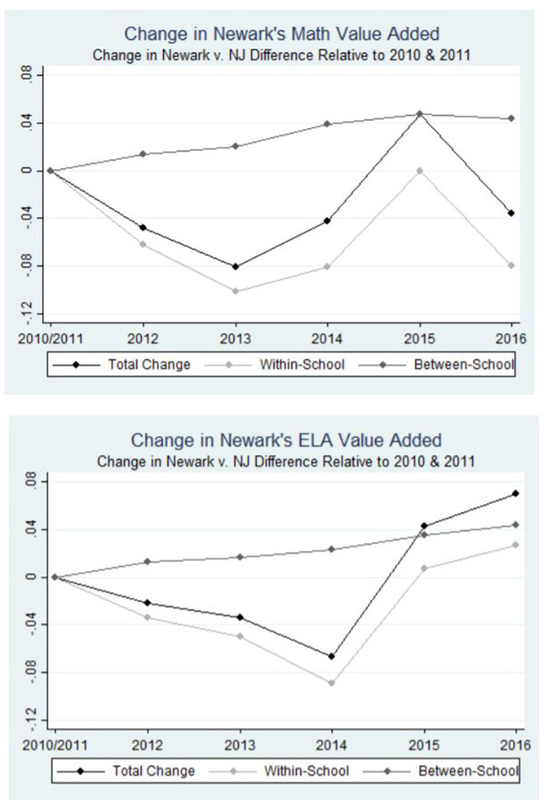 According to the report, compared to the two academic years preceding the reforms (ending in the spring of 2010 and 2011), "achievement growth in Newark improved significantly in English by 2016 and showed no significant change in math." However, the report added, progress didn't follow a straight line. Early in the reform efforts, annual average achievement sunk in both subjects for all schools; then it rebounded and increased in the two most recent years. After bouncing back in 2014-2015, "achievement growth in the average Newark school is now significantly higher than for similar students in the rest of the state in English and higher, though not significantly so, in math," the authors stated. Decomposition of Newark's change in math and English language arts relative to the rest of New Jersey. Source: NBER Working paper, "School District Reform in Newark: Within- and Between-school Changes in Achievement Growth." Most of the improvement in English achievement — 61 percent — can be attributed to shifting enrollment to "higher value-added schools," the report asserted. Those shifts occurred because schools with below-average achievement were shuttered, charter schools expanded, and universal choice simplified the process of applying for multiple and different types of schools. In fact, math growth would have declined in Newark compared to the rest of the state if enrollment hadn't shifted to those other schools, the researchers found. While school choice advocates might point to the overall positive outcomes of student learning in Newark as a reason for supporting parental choice, the researchers offered a caution: "First, reallocation was not always 'market-based,' as school closures required some students to move involuntarily," the report emphasized. "Closing schools is politically difficult." Second, Newark families had access to "an unusually effective set of charter schools nearby, which is not present in most other cities." Thus, the researchers concluded, "It would be an oversimplification to suggest that most of Newark’s progress was due solely to greater parental choice. In Newark, the positive effects of parental choice were enhanced by a series of difficult, but generally well-targeted school closures and ready access to an unusually effective charter sector." The report is available for a $5 download from the NBER website.